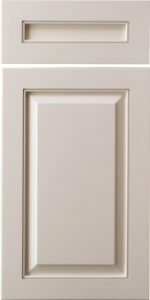 The CRP-10751 is one of Conestoga’s most popular doors, which features a delicate inside framing bead that provides a clean-lined look and subtle design element. CWS does offer a Mortise and Tenon version (CRP-10751MT) of this design as well. In order to make this door more appealing for painted finishes, CWS created the CRP-10751 (MDF). The MDF version of this door is constructed of full MDF, has five-piece miter joints, and provides a better base material for paint adhesion, expansion, and contraction than its wood brother. All 3/4" profiles available except P-106.